We’d love your help. Let us know what’s wrong with this preview of The Queen of Katwe by Tim Crothers. PHIONA MUTESI sleeps in a decrepit shack with her mother and three siblings and struggles to find a single meal each day. Based on a popular ESPN magazine article selected by Dave Eggers for The Best American Nonrequired Reading and a finalist for a National Magazine Award, the inspiring true story of Phiona Mutesi, a teenage chess prodigy from the slums of Kampala, Uganda. To ask other readers questions about The Queen of Katwe, please sign up. Pages where you can find the famous quotes from the book ?? Before you get too excited about this amazing, heart-warming, life-affirming story, soon to be filmed by Disney, you might want to check out Phiona Mutesi's FIDE rating page. Or if you want still more facts, as opposed to romantic speculations, there are 25 of her games here. Call me a cold-blooded, unpoetic chess player, but try as I will I cannot see any of the amazing talent described for example in this article. Sorry. Chess is a lot like a language: the pieces are the phonemes, and their movements are morphemes. The positions they make together on the board are like sentences and phrases, and a talented enough chess player can really make a statement.When you think about it, chess is downright magical. A universal language that transcends geographical and cultural boundaries. A language so universal that even villagers in rural Uganda can speak it. Most of the nonfiction I read tends to run along the "girl power" route, so obviously I was thrilled when I found a girl power book that was not just about one of my favorite activities but also about a woman of color competing in a game that is dominated by men. It's been turned into a movie, too. A movie I desperately want to see, which stars Lupita Nyong'o. How could this not be good? Well...I noticed a lot of the reviews for this book were not so great. That surprised me, because books like these usually have great reviews because people find them so inspiring or interesting. As I began to read the book, I began to understand why so many people had reservations about QUEEN OF KATWE. I'll list the reasons out as I go and talk about them, because the reviewers really hit the nail on the head in this case. 1. Phiona Mutesi is not actually a grandmaster. 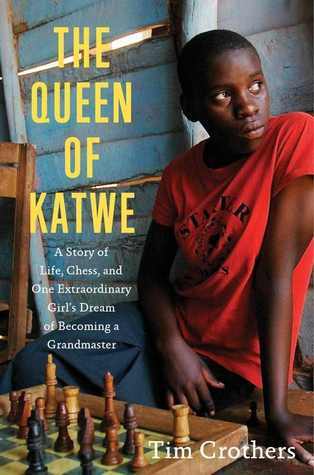 There's an alternate title of the book, "The Queen of Katwe: A Story of Life, Chess, and One Extraordinary Girl's Dream of Becoming a Grandmaster." It never explicitly states that she is a grandmaster, but it could be perceived as misleading. Maybe that's why it changed. The other title is more attention-getting, but I like this one better. It really captures her journey and ambitions in a sentence. And her rookie-status actually didn't bother me that much, because I'm a rookie player too, and I don't think it's a stretch to call her a "champion" since she really is the best chess player in Uganda...even if that's setting the bar low. 2. This book is not just Phiona Mutesi's story: This is true. Most of the book is about Phiona but there are a lot of lengthy digressions. We learn about the history of Phiona's teacher and the leader of the Sports Outreach program that allowed chess to be possible for Phiona and her friends, Robert Katende. We also learn about the white people who funded the charity and the white people who created the scholarship that allowed Phiona to go to school. These parts were interesting, especially Katende's, but they weren't Phiona's story. I could see why people were annoyed. 3. They took religion out of the movie version/this book is very preachy: Religion plays a fairly big role in this story because the Sports Outreach program was a Christian charity funded and founded by Christians. Robert Katende gives sermons targeted for young people that wouldn't be out of place in a Veggie Tales cartoon. I didn't mind this. Religion can cause people do want to do great things; in the right hands, it's a tool that lets people plunge the depths of spiritual goodness. I admire the faith and devotion of those who use their belief in God for good. That said, I can also understand why religion was left out of the movie. As controversial as it is, I think the message is that you don't have to have religion to have a moral compass that points you to better the world. Being secular makes the story more universally accessible. 4. The writing was not good: I sort of half-agree on this one. The writing was not high-brow or particularly polished, but the author got the story across in a way that was readable and interesting. Could it have been organized better? Probably. Honestly, though, it wasn't bad. Phiona is such an interesting subject and I liked how the author kind of got swept up in chess, too. He makes it sound interesting, which is hard to do in books about chess (reading about it just isn't that interesting). So yeah, the book has some flaws, and Phiona was built up to be a little greater than she actually is (at least at the moment), but I liked THE QUEEN OF KATWE. It's got girl power and chess, and it's basically a biography of a girl's hopes and dreams as they're in the process of being fulfilled. We don't know if she'll make it and neither does she, but she's working as hard as she can, against all of the odds, to make it happen. If that's not inspiring, I don't know what is. After a 5 page prologue about Phiona, we jump through a series of stories about other people. I found it to be very disjointed and confusing. Even now, after reading 100+ pages, when I go back, I have no idea who some of these people really are. What really gets me is that every person's story starts with their grandparent or parent's story, meaning that we have even more people to sort out. People that are not essential to the story. Right now I'm at the point where he's introducing the missiona After a 5 page prologue about Phiona, we jump through a series of stories about other people. I found it to be very disjointed and confusing. Even now, after reading 100+ pages, when I go back, I have no idea who some of these people really are. What really gets me is that every person's story starts with their grandparent or parent's story, meaning that we have even more people to sort out. People that are not essential to the story. Right now I'm at the point where he's introducing the missionaries that brought the soccer/chess program to Uganda and he's telling their stories in the same way. I feel like if I have to read about another person's unrelated and irrelevant parent/grandparent's life, I might toss the book across the room. What I really am interested in is Phiona's life!!!!!!! For the record, page 1-67 + 99-114 or a total of 82 pages and 36% of a 229 page book are not about the title character. I can say that I enjoyed this book, however it was a book that took it's toll. We often forget that even in this day and age there are people and places that are not as fortunate as we in America are. Robert Katende started soccer lessons in Uganda. When he realized that not all children could play soccer he started teaching children the game of chess. To get the children to participate he would feed them, a bowl of porridge, often the only meal these slum children from Katwe received in a day. P I can say that I enjoyed this book, however it was a book that took it's toll. We often forget that even in this day and age there are people and places that are not as fortunate as we in America are. Robert Katende started soccer lessons in Uganda. When he realized that not all children could play soccer he started teaching children the game of chess. To get the children to participate he would feed them, a bowl of porridge, often the only meal these slum children from Katwe received in a day. Phiona was introduced to the game of chess at the age of 9 by her brother. She started out being taught by the only other girl going to the lessons - a 3 year old. She grew and started to excel at chess. As she progressed she remained the only girl advanced enough to attend the various conferences, when the money could be found to get her there. She won her chess matches and advanced to the adult women's division - again she won. Phiona does not want to become a wife like her sisters and her mother and scrape everyday just for food to feed her children for that day. To sleep in a hut with a dirt floor, no windows, and sewage running by the door. She wants out of the slums. She helps her mother and sister, but her dream is to be able to advance her skills to a Masters in chess. Coming from severe poverty, with the worry of starvation, kidnapping or genocide, chess may be the one thing that can pull Phiona out of the slums and save her life. I got about 30% into the book and returned it because I had paid $11 for it and decided I wanted my money back. I might not have written a review at all, but because I'm a chess coach and chess author I felt that I had a duty to report my experience with the book. I did not post my review on amazon. I wanted to, but since I have the number one best seller on amazon kindle chess currently, I only wanted to write a review on there if it was positive. I didn't want it to look like I was trying to sab I got about 30% into the book and returned it because I had paid $11 for it and decided I wanted my money back. I did not post my review on amazon. I wanted to, but since I have the number one best seller on amazon kindle chess currently, I only wanted to write a review on there if it was positive. I didn't want it to look like I was trying to sabotage the competition. Here on goodreads I doubt this review would help sales of my tactics book, so I think it is ok. I doubt people on goodreads are looking for chess books in general. I very much wanted to read this book. I still want to learn more about this amazing woman who became a very strong chess player, and yet grew up in such unspeakable circumstances. And yet I was a good percentage in to the book and other than the preface (which gives a rather odd and I think, misleading view of tournament chess) the girl who becomes the chess player has not yet been mentioned. I cannot tell if the author is describing relatives, ancestors or what because he doesn't explain who these people are and why he is telling me about them. He just starts telling about random people from Uganda, with no mention of the girl chess player, and no clear direction that that's even where he is going. Certainly I get a picture of the ugliness of life in Uganda, and just how difficult it would be to succeed at chess there. At first I only gave this book one star, but since it is at least interesting and informative I decided to add two extra stars, after thinking about that for a while,. One more problem I have with the book, was the author calling her a chess master, when she only has a FIDE rating of 1600. By that measurement I am a chess master myself. She is a woman candidate master, it turns out. To gain this title you need a certain number of international wins, and it has more to do with something called "norms." I won't go into what that means, but I felt the author (Tim Crothers) should have. Granted, her circumstances make it amazing that she became anything other than another dead 12 yr old in the streets of Uganda, but I can't really speak of her circumstances as I gave up before I ever got to them. In order to just learn more about this amazing girl I suggest Wikipedia would be better than this book, but if you want to learn about how difficult life is in Uganda, perhaps this is a good book to read. I enjoyed the story told here. The title pretty much says what it’s about, a girl from the slums of Uganada learning chess, and learning how it may be the thing that helps her rise out of her poverish start. As others have commented there is a lot of other filler story around Phiona's story. For me I think there is an important piece of the story there in that Crother's describes the multigenerational poverty that has stricken these people. Sometimes he sides steps the main story to add these lit I enjoyed the story told here. The title pretty much says what it’s about, a girl from the slums of Uganada learning chess, and learning how it may be the thing that helps her rise out of her poverish start. As others have commented there is a lot of other filler story around Phiona's story. For me I think there is an important piece of the story there in that Crother's describes the multigenerational poverty that has stricken these people. Sometimes he sides steps the main story to add these little vignettes. It does disjoint the flow of the main story, but I don’t find it too hard to remember two things at once. It was an easy, quick read. I would recommend it to anyone who likes a bit of a heartwarming story, has interest in homelessness and poverty, or enjoys sports. *I recieved this book from the publisher via GR giveaway. This is such a perfect title for this book: queen, both a chess piece and the girl who defies all odds with grace and beauty. Sometimes one reads not to learn or know something, but simply to meet a person so extraordinary one thinks of her time and again. That is how I feel about this girl. I think of her time and again. This is a book that will change your perspective on many things, perhaps; but most importantly, it will show you the importance of never giving up, even when the something desir This is such a perfect title for this book: queen, both a chess piece and the girl who defies all odds with grace and beauty. Sometimes one reads not to learn or know something, but simply to meet a person so extraordinary one thinks of her time and again. That is how I feel about this girl. I think of her time and again. This is a book that will change your perspective on many things, perhaps; but most importantly, it will show you the importance of never giving up, even when the something desired looks like a lost cause. This book spoke to the teacher in me but I suspect everyone reading it will walk away with a different lesson learned. There are so many meaningful moments in the book. Phiona Mutesi has grown up in Uganda, in what must be the worst slum in the entire world-Katwe. Katwe, where human life has no value and girls are considered to be a little less than human. It is only through Phiona's grim determination to trudge through one more day, and then one more and one after that, that she survives at all. Phiona shouldn't have survived. Born to a teen mother with older children and other responsibilities; born of a father who would soon die of AIDS with another family to support; to a nation that sees thousands of its children dying from starvation and disease. Phiona shouldn't have become a queen and her story is no fairy-tale. It is indeed one more magical for it is marked by simple human perseverance. A story of a regular girl, under terribly adverse circumstances, who triumphs by finding the beauty within herself. I don't know if there are happily-ever-after's for her. I am too fearful to follow up with research. The entire time I was reading the choppy, short sentences and rambling interviews in this book, I felt as if I were reading a very, very long newspaper or magazine article. After reading the "about the author" section and learning he used to be an editor for Sports Illustrated, it all made sense. If you like reading Sports Illustrated, this book might be for you. If you like reading a hundred pages of backstory information about the dozens of family members of main characters, you're in luck. How The entire time I was reading the choppy, short sentences and rambling interviews in this book, I felt as if I were reading a very, very long newspaper or magazine article. After reading the "about the author" section and learning he used to be an editor for Sports Illustrated, it all made sense. Couldn't think of a better book to start 2017 with. The best novel I read in 2016! I must praise the women featured in the novel for their courage, perseverance and hardwork in withstanding womanisers and Aids victims- their men! Amidst poverty and corruption, Phiona rises to be the best chess player in Kotwe. The story is told in its rawest form and it has me till the last page. Another work of non - fiction to be reckoned with. Inspirational! The writing is a bit too dry, but it can't really mask a fabulous story of redemption and hope where none were supposed to exist. Very inspirational and uplifting, I truly hope this story gets a happy ending and that all good people involved get rewarded and find happiness. A beautiful and difficult book to read. This book is so hopeful and so heart-wrenching at the same time. I think it did a good job showing not only the hope that is possible, but also the grim realities of having expectations in a society and culture that can't always sustain them. It seems like Uganda is making progress, but there are still so very many limitations. It's so important that there are people trying to do scholarship programs so these kids can go to school, and get a good meal, and learn something fun, beyond just academ This book is so hopeful and so heart-wrenching at the same time. I think it did a good job showing not only the hope that is possible, but also the grim realities of having expectations in a society and culture that can't always sustain them. It seems like Uganda is making progress, but there are still so very many limitations. It's so important that there are people trying to do scholarship programs so these kids can go to school, and get a good meal, and learn something fun, beyond just academics. Maybe they can't make a career out of chess, but it certainly teaches life skills and gives them a way to connect beyond just getting the next meal in the slum. Not only is this a really inspiring story (especially for females), it's also a tremendous eye-opener about the world that exists outside the comforts that we know/take for granted. Many of our problems are nothing compared to the problems that Phiona and the rest of the children in the Katwe slum have to face. Tim did a good job getting the conditions of the slum across. Phiona is truly an underdog, and I think all students should read her story to expand their horizons/dream bigger. What I thin Not only is this a really inspiring story (especially for females), it's also a tremendous eye-opener about the world that exists outside the comforts that we know/take for granted. Many of our problems are nothing compared to the problems that Phiona and the rest of the children in the Katwe slum have to face. Tim did a good job getting the conditions of the slum across. Phiona is truly an underdog, and I think all students should read her story to expand their horizons/dream bigger. What I think could have been improved, however, was the flow of the story. I thought Tim kept introducing people at random times. Often, I could not remember how all the characters that were introduced related back to each other. Tim should have focused the main storyline on Phiona, rather than jumping between the backgrounds of all the characters. The other characters' backgrounds are certainly touching as well, but take away from the main storyline of the book. The entire reasoning behind the book title, "The Queen of Katwe" was also not explained until the end of the book, where Tim finally mentioned how it related to the story and the history of Ugandan sports. Subtitled “A Story of Life, Chess, and One Extraordinary Girl's Dream of Becoming a Grandmaster”, the book tells the true story of Phiona Mutesi, a girl from the Katwe slum area of Kampala, Uganda. Phiona’s aptitude for chess is spotted by an inspirational mentor, Robert Katende, and soon it offers her the tantalising possibility of finding a route out of poverty and hardship. She joins his group of “Pioneers” and it soon becomes obvious that she has a special talent. When Phiona achieves her first tournament success, it opens up thoughts of new possibilities: ‘I remember by the time I got home I felt I was not the Phiona of always. I was a different Phiona.’ However, the book puts into context Phiona’s achievements in the chess world, which although tremendous for a girl of her background, are a long way from achieving the goal of becoming a Grandmaster. Similarly, the author is brutally realistic about the challenge Phiona faces in achieving this goal because of the need for financial support that is probably beyond the means of a country like Uganda, unlike countries like China, Russia, etc. In fact, it is this book (and subsequently the film adaptation of it) that has brought most financial benefit for Phiona and her family so far. In separate sections of the book, the author contrasts Phiona’s story with the story of other Ugandan athletes and the struggles they faced to compete on equal terms in the world. He also provides a lot of information about the founding of Sports Outreach, the project that enabled Robert Katende to set up his chess group. This book was a beautiful story of a girl growing up in the slums overcoming all odds. It was very inspirational. I didn't love the writing style. The author jumped around a lot and it was hard to keep straight who he was talking about. They title is a little deceiving as there are so many other people the book is actually about. I found her mentor particularly inspiring. This book gave me a sense of thankfulness for the life I have. It also broke my heart for the people living in countries like This book was a beautiful story of a girl growing up in the slums overcoming all odds. It was very inspirational. A very inspiring story. I hope that Phiona is able to leave the slums and go on to do great things and that those she meets are inspired to do the same. This story gave me a better idea of what it's like to live in extreme poverty. There are so many challenges and obstacles to overcome, but even small things can help by giving those people a voice and by giving them hope. It's inspired me to be more aware of what's happening in the world and try to do more to help. This was a fun read for me. Sports Outreach Institute is a ministry we've supported for 20 years. Among the many great ways they're serving some of the poorest of the poor around the world are projects of loving kids in the slums of Kampala, Uganda and Nairobi, Kenya. While Soccer has always been a useful tool in bringing kids together, some kids aren't interested, so a leader had an idea. He pulled out a couple chess boards, started teaching kids how to play, and gained entre into the lives a w This was a fun read for me. Sports Outreach Institute is a ministry we've supported for 20 years. Among the many great ways they're serving some of the poorest of the poor around the world are projects of loving kids in the slums of Kampala, Uganda and Nairobi, Kenya. While Soccer has always been a useful tool in bringing kids together, some kids aren't interested, so a leader had an idea. He pulled out a couple chess boards, started teaching kids how to play, and gained entre into the lives a whole different group of broken kids. This book follows the remarkable story of Phiona Mutwesi, one girl whose curiosity pulled her out of her slum driven protective shell into a true community that was building around this little idea of a chess club. As it turns out, Phiona has quite a brain for chess. So much so that she found herself competing in October 2010, at just 16 years of age, representing Uganda at the world's highest level - the Chess Olympiad hosted in Russia. Also in 2010, a group of my closest friends and I turned 40. To celebrate, we jumped on a plane in August and spent two weeks in Africa encouraging our Sports Outreach friends and seeing first hand the great work they're doing. Along the way we deepened our friendships with stars in this story, Robert, Aloysius, Barnabas, Rodney, and many others not mentioned by name. We only got to spend one day in Katwe, but did get to meet many of the kids in the chess club. It's fun to see good work celebrated. The truth is, these friends are slogging it out daily in very difficult conditions, with very limited resources, but bringing light and life, not to mention food and hope, into very dark places. HOW DID THAT GET PUBLISHED?!?! It didn't only do that once, but throughout the book sentences and quotes were written like that. I also feel like sometimes the author had a great opportunity for an amazing, captivating paragraph opening, but missed it entirely. It's hard to explain, but I was very unsatisfied with the way the book was written. Additionally, the title says 'One Extraordinary Girl's Dream of Becoming a Grandmaster'. And that's how it ended. With her having a dream of being a grandmaster. WHAT NEXT?!?!?! Really?! To add onto this, what also really got on my nerves, it went on and on about other people's lives and the life of people in the book that only appear about once. This book had amazing potential, and it got ruined. I think they rushed writing the book because they didn't give Phiona enough time to become a Grandmaster or not. The book literally ended with her still training. The story was ok, but aggravating. 5 stars for Phiona - an amazing, talented young girl who lives in a slum in Kampala, Uganda and through hard work, perseverance and an incredible spirit, ends up playing against players from all over the world at the chess Olympiad in Russia. She is a true inspiration and her story needed to be told. 2 stars for the book, which was difficult, choppy and often boring to read. It described in too much detail the lives of really random and irrelevant people who were involved in the periphery of Phio 5 stars for Phiona - an amazing, talented young girl who lives in a slum in Kampala, Uganda and through hard work, perseverance and an incredible spirit, ends up playing against players from all over the world at the chess Olympiad in Russia. She is a true inspiration and her story needed to be told. A moving and universal story of the power of potential and the wonder of perseverance. This story will inspire you — and will make you wonder how many more Phionas there are among us. [A] story of a young woman’s triumph over the unimaginably cruel fortune … would pierce a heart of stone. Almost too uplifting to believe … Crothers tells Phiona Mutesi’s st A moving and universal story of the power of potential and the wonder of perseverance. This story will inspire you — and will make you wonder how many more Phionas there are among us. Almost too uplifting to believe … Crothers tells Phiona Mutesi’s story in a crisp, reportorial style, but it’s nearly impossible to read without a strong emotional response … Inspiring. In The Queen of Katwe Tim Crothers gives us an inspiring and heart-wrenching story. Crothers portrays Phiona’s story with depth and sensitivity … in bringing the story to a world audience, Crothers has shone light on a neglected corner of the globe, and he reveals what a difference hope, care and encouragement can make to people's lives. If you don’t already know the name [Phiona Mutesi], it’s time you learned about this amazing person and how she achieved such goals in the face of near impossibility. [A] moving account of an impoverished Ugandan girl’s unlikely rise to prominence … a poignant reminder of the power of hope. Not just inspirational but a corrective to our most damning assumptions … A must-read. Masterful … an important book. We tend to forget how most of the world lives. Phiona’s story is a moving reminder that every life holds value, and we have the opportunity to influence the endgame. A gritty inspiration. An extraordinary account of one young woman’s exceptional achievement. It is also a lament for this world in which only a tiny number of incredibly fortunate and exceptionally determined children have any chance of escaping the dehumanising poverty that prevails in Katwe and places like it. An inspirational profile of an amazing chess player from one of the world’s worst slums. Powerfully captures the crushing poverty in which Mutesi and her family still live. Tim Crothers’ story is engrossing and inspiring … a heart-warming testament to Phiona’s determination and courage. One of the most inspiring, thought-provoking, humbling books I’ve ever read. 3.5 stars. I have mixed feelings about this book. On one hand, I enjoyed reading about Phiona’s story. On the other, while the writing is good, I thought the story’s organization was disjointed. I often became frustrated at how much of the story focused on other people. I get that these folks are a part, even essential, to Phoina’s story, but the disjointedness of the story didn’t clearly connect all the people up front. And there were a couple parts that I felt were included simply to increase 3.5 stars. I have mixed feelings about this book. On one hand, I enjoyed reading about Phiona’s story. On the other, while the writing is good, I thought the story’s organization was disjointed. I often became frustrated at how much of the story focused on other people. I get that these folks are a part, even essential, to Phoina’s story, but the disjointedness of the story didn’t clearly connect all the people up front. And there were a couple parts that I felt were included simply to increase page length, because those sections really didn’t add value to the overall story. I also feel the title, tag line, & synopsis are misleading as this story is more than Phiona’s story to discuss the children and chess program of Katwe. Clearly, anyone’s story takes a village. No one gets somewhere without help, mentors, family, etc. But a good percentage of the book was spent dealing with the backstories of these folks, which again, for the most part, didn’t add value to the telling of Phiona’s story. Once I began reading this story, I was drawn into the amazing chain of events that brought Robert Katende and Fiona (Phiona) Mutesi together on a verandah in Katwe, one of several Kampala slums. To follow her from her first chess lessons to her successful championship performances is thrilling; to see her struggling with conflicts between the culture of poverty and “the world out there” is painful emotionally and psychologically. Katende was not only a chess teacher and coach, he became a LIFE C Once I began reading this story, I was drawn into the amazing chain of events that brought Robert Katende and Fiona (Phiona) Mutesi together on a verandah in Katwe, one of several Kampala slums. To follow her from her first chess lessons to her successful championship performances is thrilling; to see her struggling with conflicts between the culture of poverty and “the world out there” is painful emotionally and psychologically. Katende was not only a chess teacher and coach, he became a LIFE COACH for every student, teaching lessons for character and relationships. He gave hope and encouragement. His personal relationship with Christ affected how he related to the children. He wanted them to learn how to live. He challenged the students about their place in the world—questions good for readers too. Are you happy with the life you are leading? What do you need to do to do that? “Phiona was another kid whose life had left its predestined path through sport. Another grinder who has lived the in-between. Another person from a sheltered background inspired by the idea that there might be something else out there.” (pp. 191-192) But Phiona had inner strength and a hunger to play chess. Robert Katende is a hero for investing in the lives of the next generation, giving hope. "The project was full of street kids. Kids who didn't go to school. Many were orphans. Some were homeless. All of them were desperate for guidance in their own way.
" ' Some of the kids challenged me initially, but I was certain I could handle any bad behavior because I had lived in the situation they were in,' Katende says. 'I told them I was not there to judge them, but to love them. I found that if you treated them with respect, you could open up a lot in their hearts. learned not to always do "The project was full of street kids. Kids who didn't go to school. Many were orphans. Some were homeless. All of them were desperate for guidance in their own way. "Day after day on the roadside, Harriet split a single cassava among her children while she fasted on water. Harriet survived on small donations from friends in the church, who eventually persuaded her that living in the street wasn't safe for the children and that she should take her family to sleep in the church once it had emptied each evening. "So St. Peter stepped out of the boat and he went to where Jesus was. For all of you, learning chess has not been a walkover. For all of you it involved diligence, commitment, determination, faith, and then being here day after day. But through that because you turned up for the program, someone came in and said, 'Hey, these kids are doing well in chess, but they are not studying. If they can do well in chess, then given an opportunity to study they can do well in school.' This education has not come because someone found you out there. It is because you took a step to come for the program. Other people dropped off, but you kept on coming. "When Bishop Mugerwa was approached by Robert Katende years ago and asked about the use of his veranda to shelter his chess program, Mugerwa had never hear of chess. Listened to this as an audio book. 1) There are a lot of names and brief biographies given in the first couple chapters. I would have flipped through those introductions numerous times if given the chance. 2) This book is about much more than Phiona. 3) I really appreciate the ambiguity of the beginning, middle and end. You can’t wrap this story into a pretty package. There are so many nuggets of wisdom in this story. And also so much sadness and very very little joy. But it is not a sad story eit Listened to this as an audio book. 3) I really appreciate the ambiguity of the beginning, middle and end. You can’t wrap this story into a pretty package. There are so many nuggets of wisdom in this story. And also so much sadness and very very little joy. But it is not a sad story either. Somehow I am left with a vague sense of both hope and hopelessness. I look forward to seeing the movie. I know it will be a sanitized, glamorized telling of the story. But it might also be one I’m willing to let my small children listen to. The book is not for the under-10 crowd. Overall, I recommend the book. Tim Crothers is a former senior writer at Sports Illustrated who is currently a journalism professor and a freelance sportswriter. He is the author of The Man Watching, a biography of Anson Dorrance, the legendary coach of the University of North Carolina women's soccer team, co-author of Hard Work, the autobiography of UNC basketball coach Roy Williams, and author of The Queen of Katwe, the story Tim Crothers is a former senior writer at Sports Illustrated who is currently a journalism professor and a freelance sportswriter. He is the author of The Man Watching, a biography of Anson Dorrance, the legendary coach of the University of North Carolina women's soccer team, co-author of Hard Work, the autobiography of UNC basketball coach Roy Williams, and author of The Queen of Katwe, the story of a 16-year-old female chess champion from the slums of Kampala, Uganda.